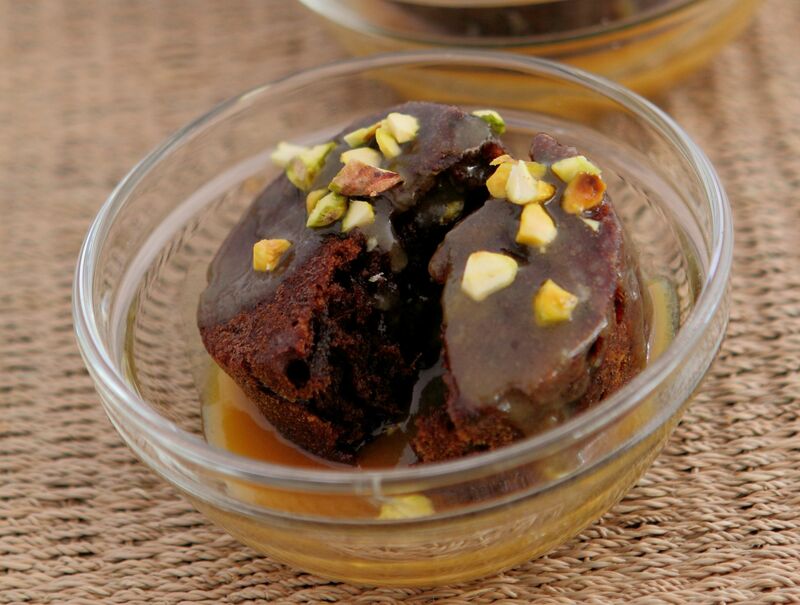 Originating from Britain, the Sticky Date Pudding is also popular among locals as a delicious dessert for the season of Ramadan and Raya. This recipe was first published in Flavours magazine. Place the dates and water in a pot and bring to a boil. Remove from heat, stir in the soda bicarbonate, cover the pot with a lid and leave for 5 minutes. Pour the mixture into a bowl and leave to cool. Then, fold in the sugar, butter and eggs, followed by the flour and salt. Lightly butter muffin tins and pour the mixture into them. Bake in a 180°C pre-heated oven for about 20-30 minutes, depending on the size of the tin, then remove from oven. Place all the ingredients into a small saucepan, and cook over low heat, stiring continuously. Cook till sauce becomes smooth and slightly thickened. Prick the cake with a skewer then spoon the sauce over it. Let the pudding sit for 10 minutes, then turn it out onto a plate. Serve warm with drizzles of butterscotch sauce.